We investigated the spatial characteristics of the diffuse light in the eye at two different wavelengths and the extent to which this may affect red–green relative spectral sensitivity. 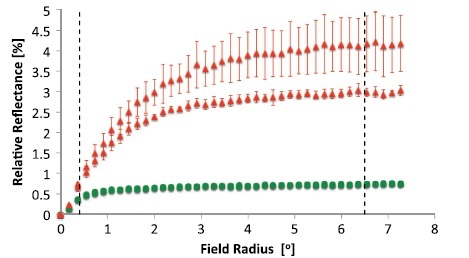 The fundus reflectance of six subjects was measured for different field sizes ranging from a 0.18° to 7.28° radius and for two different wavelengths, 560 and 650 nm. The experimental setup consisted of having an instrument project uniform disks on the fundus and recording their retinal images after a double pass through the eye. Additionally, the relative spectral sensitivity for the same wavelengths was measured using heterochromatic flicker photometry for a stimulus of a 0.4° radius with and without the presence of a synchronously flickering concentric annulus. We concluded that although light backscattered from the fundus contributes to vision, the effect is not strong and can only be observed under appropriate laboratory conditions. This suggests that diffuse light from deeper fundus layers is unlikely to have a practical relevance to vision.